This is the first summer in a long, long, long time that I can remember that we never did make it to the beach. No sand between the toes, no salty ocean water, and no frozen chocolate malt cup with one of those little wooden spoons. It’s a little bit of a bummer since we are less than an hour from the ocean’s shore. But, things happen and life rolls on. There will be many more summer’s at the beach. This is me pouting a little, and stomping my feet a couple of times. I have such great memories of going to the beach with all of my kids, and their cousins. For a few summers we would go to the beach once a week. We’d leave right after lunch and get to the ocean’s shore around 2pm. We’d take dinner with us. Cold chicken legs, watermelon, and an assortment of chips and what not’s. We’d swim and watch the sunset, and would not leave until it got dark. Such good times and such great memories. Sometimes I would have 5 or 6 kids in the car with me, along with all of the boogie boards, towels, lots of sunscreen, and food. My Momster van would be stuffed to the brim. For quite a few years we had an annual family picnic at the beach. We would set the date so everyone could be together for a day of fun in the sun. There would be tons of food, a few e-z ups for shade, lots of chairs, and a wagon to haul it all in. Then there is a certain Travel Guy in the family who would get to the beach extremely early, I’m talking like 6 or 7 am. He would stake out a fire ring, take a grill with him to cook on, and get a spot all staked out for the day. I’m sure I remember him taking some parking cones to help him stake out our “party zone” for the day. He’d usually have a few helpers with him, who’d get treated to a breakfast cooked beachside. Family members would trickle into the “party zone” throughout the day. There would be lots of eating and swimming, swimming and eating, Frisbees, a few baseball gloves and a ball for the kids to play pickle, and maybe a kite or two. By dinnertime we’d have a fire roaring in the ring. Hot dogs and hamburgers roasting, salads galore, and all of the kids just chomping at the bit to roast marshmallows for their s’mores. Of course it wouldn’t be a proper marshmallow fest without a game of chubby bunny first. We’d roast lots and lots of mallows, eat s’mores, laugh and kibbutz about all things family. The day would end when the beach closed, around 10pm, and then it was the long, tired trek home. Such great memories and such good times. It’s been a few years since we’ve gotten all of the gang together for a family beach day. It gets harder and harder every year with all of the kids moving along in their own directions. It was a fun family tradition that hopefully we can revive again soon. Now fall is upon us. 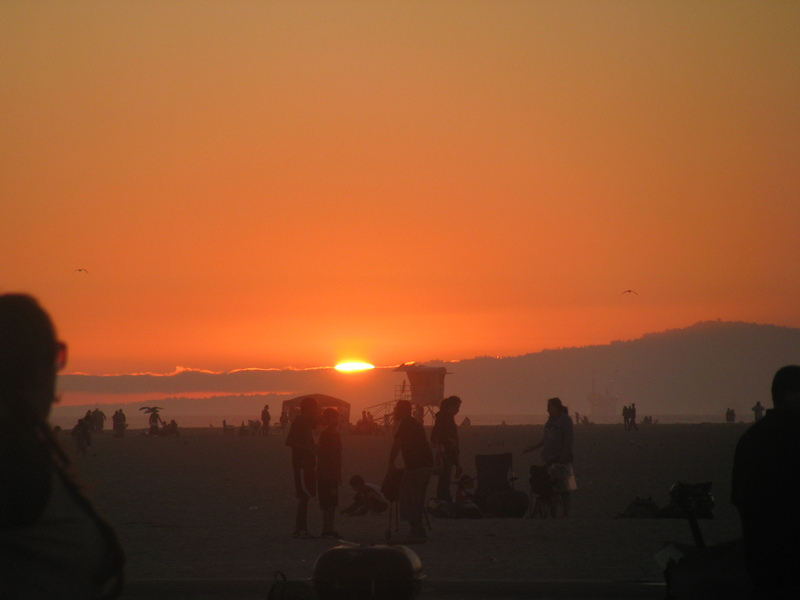 Here in Southern California we look forward to the cooler days and nights. Many, many cooler nights. We still can get to the beach a time or two, it’s just not the same as during the hot days of summer. Does your family have a favorite summertime get together? This post was penned a few weeks ago, while I was on the plane with Travel Man going back to Illinois to see our family. I wanted to share it with all of you because we were having so much fun together, and I always love sharing tales of my Travel Guy’s crazy work lifestyle. 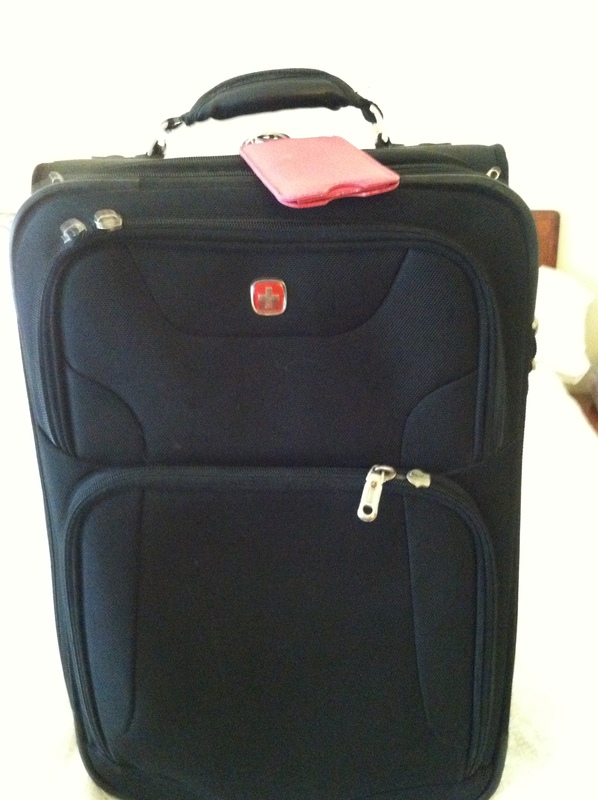 June 20, 2013: This weekend Travel Man and I are actually taking a little vacation trip together. Yay!! I’m writing this post from 30,000 feet somewhere between Denver and Milwaukee. It is so nice to see Travel Man relaxed, laughing, and smiling. So needless to say he’s been making the “rounds” so to speak. He’s been in a lot of airports, and had lots of rides in “tubes”. That’s my new catch phrase for his airplane travel, or should I say where his office is located!! He’s been getting a little burnt out on the airport/airplane routine. He’ll ask me, “What day is it?, or Where was I last week?”. Thank goodness for our electronic calendars. That’s how we keep track of all of his travels. Getting to take a trip just for family and fun is just plain good medicine for his soul right now. Plus we get to be together for a few days too!! Bonus! 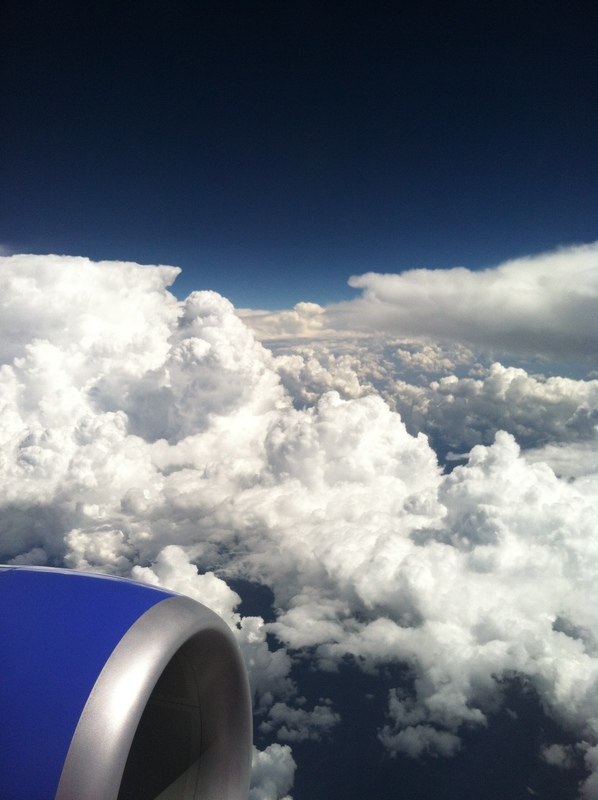 Travel Man wanted me to write about our travel experiences on Southwest Airlines. I’m saving that post for another day. Today is about how great it is to be able to spend time with my husband. Every trip we take no, matter how big or small becomes an adventure with him. He’s a professional people watcher, because he’s in airports and amongst the crowds so much. He loves to try to guess where people are going, or which person belongs with who, or what their life story is. It can really be entertaining. This weekend we are heading to Illinois to celebrate my grandparents 50th wedding anniversary. We are looking forward to some big hugs, lots of gabbing, and then some more hugs. My parents are there, and my brother and sister are joining us too. I think it’s the first time we’ve all been in Illinois together since 1986. This weekend I am determined to get the story of how my grandparents met committed to paper or some sort of electronic device. A story that I want to have for posterity’s sake, and for all the grandkids to hear. More on our weekend travels soon. Memories will be made, pictures will be posted, and then the long, goodbye hugs will be upon us. Postscript: As you can probably tell I wrote this post prior to my Dad’s unexpected passing. See my post from July 4, 2013. Little did any of us know that fate brought us all together with my grandparents one last time. 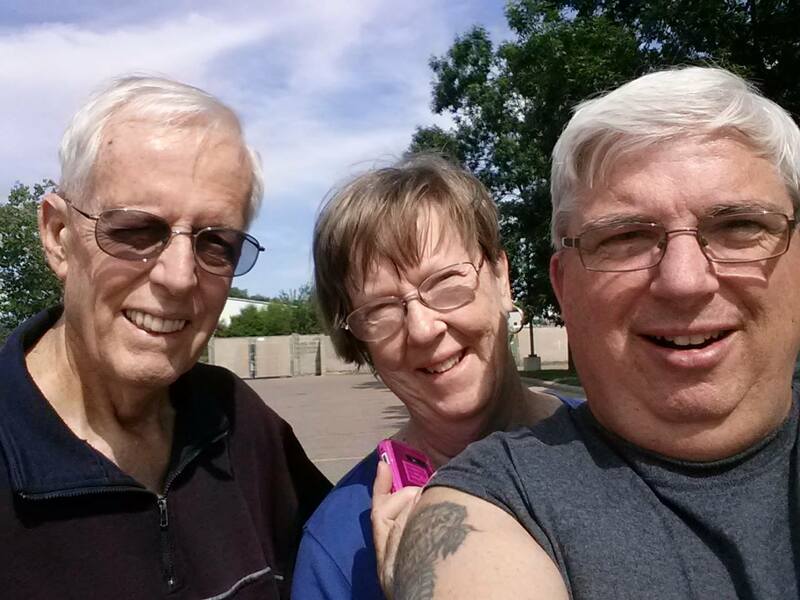 My parents are travelling across the country this week to visit my grandparents in Illinois. Travel Man is working in Sioux Falls, South Dakota this week. Ironically, my parents happened to be driving right through Sioux Falls today, and were able to hook up with Travel Man for a quick-lunch. What are the chances that the stars would align, and this would happen. It’s a kismet, karma kind of thing. I think it was all meant to be. You see my siblings and I, and Travel Man were worried about our parentals taking this driving trip. And to Mom and Dad, when you read this blog post, you have to know we were worrying about you. If you have been following my blog for any length of time you know that my Dad is winning his battle with Stage 4 lung cancer!! He’s been doing some alternative chemotherapy since last June, and he’s winning the fight. His strength and endurance are not yet 100%, but his will and his attitude are at 150% plus. Never the less being the good kids that we are we were worried about them taking this drive. We put our minds at ease knowing that if they had any trouble while they were on the road we were just a plane ride and a car drive away. There was also this little thing of thinking that we could tell our Dad what to do. Ha! That would definitely not be happening. So, as of this writing they have already been on the road for ten days. They visited my sister and her husband in Montana, and stopped in South Dakota for a day of rest, and driver’s license renewals. Next, they are on their way to Illinois to see the grandparents. All in all a good trip for them so far. Any worries that we all had we are just tucking under our chairs, and wishing them safe travels. For me, my parents adventure is a great lesson in perseverance. Doing what you want to do, when you want to, and not letting anything stop you in your tracks. I’m on the road with Travel Man this week. Yesterday we took a short flight to the Sacramento airport. Only a little over an hour in the air (we call these up/downs). Everything went fine. Flight was good, got in just a tad late, walked through the terminal to get ourselves to baggage claim. Oh wait, and before we mosied over to baggage claim Travel Man had to make a mad dash back on the plane. He left his Nexxus tablet in the seat back (this never, ever happens to him). He tried to claim I distracted his “normal” flight check routine. The nerve!! Now we’re at the baggage claim waiting for our suitcases. Travel Man tells me a little story he read about suitcases being stolen right from the baggage carousel. We’re still waiting for our bags. Finally here comes the big Travel Man bag, his tool box, and we spot my bag with the pink luggage tag at the top of the carousel. Travel Man’s bags come around the carousel no problem, and then we’re waiting for my bag. Waiting, waiting and no bag. So, Travel Man booked it into high gear around the other side of the carousel. I’m watching the people leaving to make sure my bag with the pink tag is not rolling out the door without me. Travel Man gets to the other side of the carousel, and my bag was just sitting on the floor, off of the carousel. The nerve of some people. Someone took my bag off of the carousel, realized it was not their bag, and just left it sitting there. Luckily we were pay attention, and my Super Traveler rescued my bag from the perils of some other fate. Thought for the day – always pay attention to your belongings when you are on the road. Oh and don’t leave home with out a Travel Man! !